Last night Bobby and I went to one of my best high school friend’s wedding. (I wore this dress to last year’s holiday party.) Isn’t Bobby’s new suit great? He got a black one too. The bride was beautiful. I don’t have any pictures that actually came out, but trust me – gorgeous. After my complaining I did get in some exercise yesterday – I did a 2.2 mile walk with my parents’ pups (down to the end of the road and back) and then I danced at the reception for a long time. The food was great as well and it was such a nice evening. My one complaint? They stole our wedding song! I’m half kidding… We’ll probably still use it because it seems like a very popular song. We are finally finishing the move up to the city today. We’re seeing New Moon at 1pm with some friends and then we’re driving in with my dad‘s truck and the cats. Yesterday (Friday) was a hectic day! Bobby and I drove into the city to drop off a bunch of stuff at our apartment (we’re moving in this weekend), got a parking ticket ($95 – wtf), picked up Bobby’s new suits (they’re beautiful – Michael Kors), ate out twice, I got a mani cure, and we both got ready for my friend’s wedding today (Saturday). And then you get your entree. Mine came with rice on the side but I saved it to make fried rice later. Edo’s is my favorite Pennington restaurant. Dinner was at a new place called Pho 99; it’s Vietnamese. It’s up on Route 27 past Princeton. 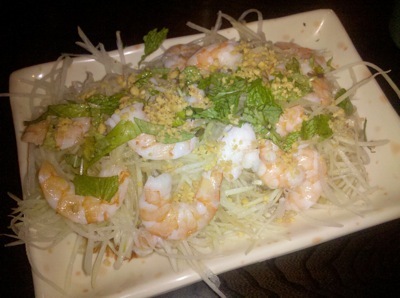 I opted for the papaya salad with shrimp (my usual). It comes with peanuts and a nice Vietnamese dressing. I also add hoisin sauce. It was actually quite average and much smaller than I’m used to. Bobby offered to share his very large bowl of pho with me (beef noodle soup) and I happily obliged. 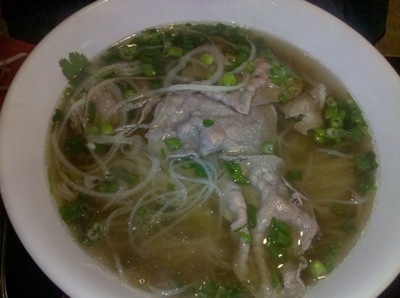 The pho was delicious. The broth was really good; so was the beef; the noodles were just average though. I’m like Heather; I don’t have beef often, but sometimes it just hits the spot. This was super lean and thinly sliced. I have to go get dressed and ready for the wedding (it’s at 2:30pm)… after the reception we’ll do some more moving or wait until tomorrow. Holding myself accountable – I have not gotten in a good workout this week or last week at all. I want to get back on track with that. I haven’t even been able to do my standard walking or yoga. I’m writing this here for answerability. Maybe I’ll try to get a walk in before the wedding. I have also been eating grapes by the pound, and I need to stop for the sake of my skin, tummy, and wallet (grapes are expensive; they make me bloat; I just had a facial – I don’t want to ruin it). The facialist said to cut back on sugar and I want to listen to her (I know she’s right). I’m eating lots of yums at my parents’. My mom made this wonderful amazing stir-fry tonight for dinner. I don’t know the recipe, but I know it had lots of peanut butter. It was delicious. Maybe I’ll ask her how she made it sometime soon. It had all of my favorite veggies – broccoli, mushrooms, carrots (which I actually avoided because I’m trying not to turn orange), and red peppers. She’s not scared to use enough oil to make it taste good either. I like to top it with milk (whole cow’s milk or more almond milk) and maple syrup or honey. My facial lady told me to avoid sugar and see what happens (I know what will happen – my face will be clear), so today I had it with no syrup (but extra milk). Uh oh. I think I have a new addiction. It sounds like kabocha, but it’s more expensive – kombucha. The one I tried was $3.39 (yikes) and it was "GT’s Organic Botanic No. 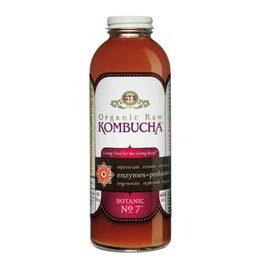 7 Kombucha". I specifically got the one with probiotics to help with my digestion. This one was raw. 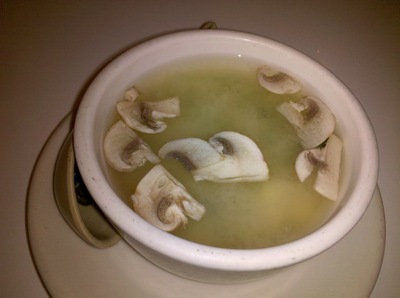 Kombucha is a fermented Chinese tea. It takes about 30 days to make; during the process various nutrients are formed (enzymes, probiotics, amino acids, antioxidants, and polyphenols). It’s basically the healthiest thing you could possibly drink. Some people say it tastes like vinegar; I thought it tasted a little bit like wine, only fizzy and better (I don’t really like wine). I’ll definitely be buying this again as soon as I can wrap my head around the price. It’s so darn pricey. I will absolutely try to make this in the future. Tips? Speaking of yummy things, I did these 5 videos yesterday for exercise. They are each 10 minutes. Try them out! My sister loves Polly’s videos too. Appetizer: Heavenly Stuffed Wings – de-boned chicken wings stuffed with ground chicken, silver noodle, cilantro, water chestnut and black mushroom. They came with this great sweet dipping sauce. This was kind of scary at first (fried! processed! breaded!) but the deliciousness made up for it. For dinner we shared 4 dishes. The Blue Mango Fried Rice – a big house special: chicken fried rice topped with sweet garlic pork. The Green Curry – eggplant, bamboo, and bell pepper are soaked in coconut milk, with a hint of basil (cannot be mild). Mushroom Mountain, as usual – soft tofu, baby corn, bamboo, straw mushroom, and bean sprout stir-fried with a bit of green curry paste. Sesame seed are sprinkled on for a beautiful finish. And Basil Chili Chicken, also as usual – with bell pepper and onion. After dinner we went out for dessert (frozen yogurt) at Golden Spoon – pumpkin pie and chocolate flavors. The toppings were raspberries, mango (not ripe, unfortunately), and crushed brownie bits. Now that I’m in NJ I don’t have Blue Mango. But I do have Edo Sushi! Bobby, Julia, and I all went out for dinner tonight. I love this place. 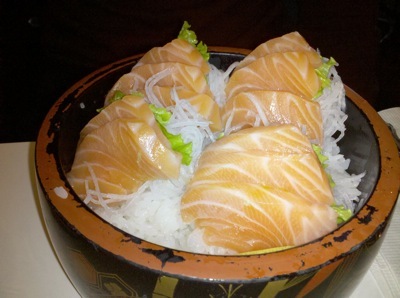 Edo Sushi is a Japanese and Chinese restaurant on Route 31 in the same shopping center as Pennington Market. It’s about a 10 minute walk from my parents’ house. First is the tea… (unlimited and free – my two favorite qualities). Notice my cool NY key chain – it’s kind of vintage because it has the twin towers on it. I think I got it back in middle school. I got chicken and broccoli with the sauce on the side (brown sauce). The other pictures didn’t come out, but Julia got veggies and tofu with the sauce on the side (also brown sauce). 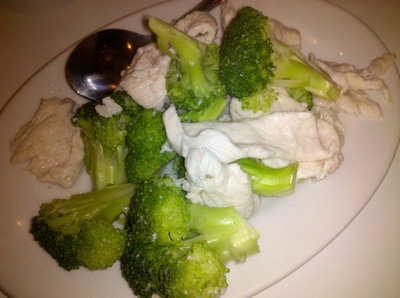 Bobby got the Dragon vs. Phoenix – chicken, shrimp, and veggies stir-fried with yet another brown sauce. He also got a big pot of rice. We finished everything. The check came with pineapple cubes and fortune cookies. Yum! I love Edo’s. This dinner was nice after my indulgent afternoon… My parents gave me a massage + facial combo for my birthday and I finally used it. I went to Sydney Albert Salon Spa in Princeton. I’d highly recommend this place – I’ve been going there for years and I’ve always loved everything. Their haircuts are amazing, the facials are fantastic, and the massage was wonderful. Bobby also got a massage and he loved it. While we were getting pampered, our Relocube arrived. Now we have to unpack it. I’m going into the city tomorrow, but when I get home I think we’re going to try to start sorting through all of our stuff. It’ll be a big project.